One of Nashville’s most underrated bands is back with a brand new album. 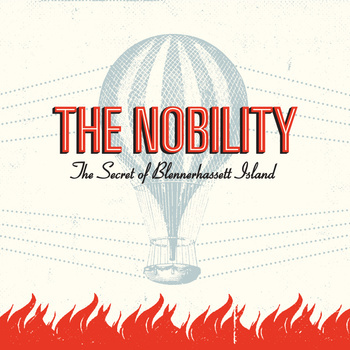 The Nobility (formerly Jetpack, then Jetpack UK) just released their latest, The Secret of Blennerhassett Island, and it’s a masterpiece. 2007’s The Mezzanine was their first proper album under the new moniker, and it firmly set the tone for their future as a band. That tone was one of more mature, intricate, and clever songs with a wide array of instrumentation, all with an unwavering pop sensibility. They stated in their own description of the album that they had been listening to early Paul McCartney and Kinks records, and it shows. TSBI (I refuse to type that name again!) is clearly influenced by the same era of pop music, but no matter how obvious the influences are, these songs never get old or tired. I’ve always loved a good marriage of band to producer, and this album is no exception. They worked with Brian Carter of Paradox Productions as they did with The Mezzanine, and honestly I don’t think there’s a better producer for this band than him. The orchestral instrumentation fits perfectly where it’s used, and it’s never over-used. Especially impressive are the horn arrangements. TSBI is easily one of the best albums to come out of Nashville’s rock scene this year, so go get it at their bandcamp page and thank me later. AND go see them at the record release party on Nov. 14th Nov. 4th at the Rutledge.